When you hear the word air pollution, your mind likely goes straight to images of smog-filled streets and billowing plumes of smoke. However, your home’s air supply is just as likely to become polluted, which can have even larger consequences for your family’s health. In fact, many experts have reported that poor indoor air quality is up to five times worse for your health than poor outdoor air quality. Today, we’ll be taking a look at some of the reasons why your home’s air quality might be bad, and how you can improve it. Want to ensure your HVAC system isn’t creating health problems for you and your family? Call Altman’s Cooling & Heating in Titusville today to schedule your inspection. While their intent is to make your house look cleaner, many household cleaning products contain pollutants that can be quite harmful once they get mixed into your air supply. This is especially the case for products that are sprayed, as their very nature requires them to be expelled into the air. Look for cleaning products that are open about their contents and stick to ones that are considered “green”. It’s not a secret how harmful cigarettes are to your health, but that danger increases when cigarette smoke is mixed in with your home’s air supply. Due to the hundreds of toxic substances found within cigarette smoke, it is one of the most common and most harmful causes of poor indoor air quality. Keep the smoke outside if you must. There’s nothing like a fresh coat of paint to breathe new life into a room. However, depending on the type of paint you use, it might make breathing more difficult for your family. Avoid paints that contain high levels of VOCs (volatile organic compounds) to reduce the impact it can have on the air quality. It’s also a good idea to have windows open to release any contaminants from the house, as extended exposure to VOCs can lead to cancer and other health issues. Here in Florida, we are both blessed and cursed with a warm and humid climate. That humidity can make it much easier for harmful mold and mildew to grow, which can cause a variety of health problems when you breathe them in. If your home is exceptionally humid, use a dehumidifier to prevent mold growth. Your home’s ventilation and duct system is very important to the health of everyone inside. If it isn’t ventilating properly, due to a build-up of debris, dust, or dirt, those contaminants will be recycled through the air supply. This can lead to allergies and other health troubles. Make sure your ventilation system is working properly and your ducts are clean to clear it all up. 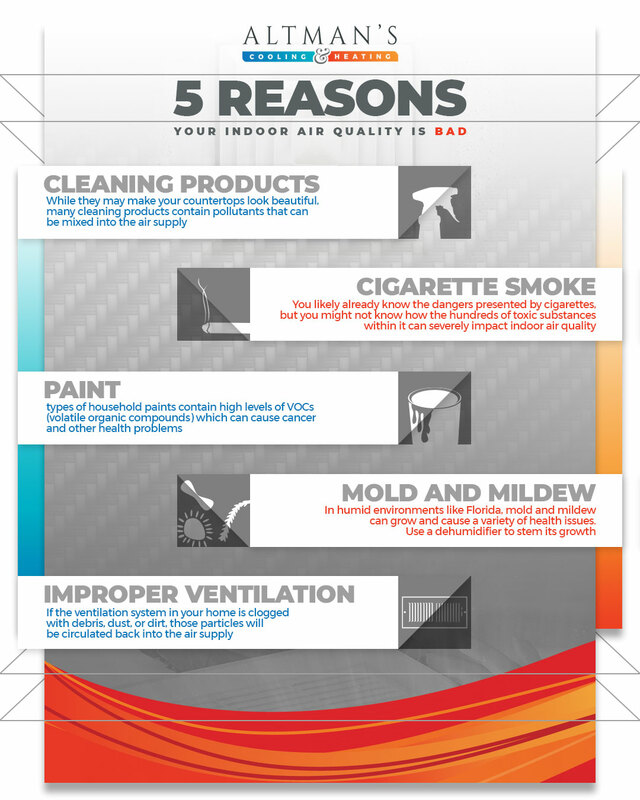 While it might not be the most interesting topic, indoor air quality is something that has a big effect on our lives and health. Take steps to improve your air quality so you can breathe easy at home. If you need your HVAC system inspected to ensure your air quality is the best it can be, call Altman’s Cooling & Heating in Titusville to schedule your appointment.